Although white wood sticks are popular, brown timber is usually just as good. It just comes from a different part of the tree trunk. Look for cut-price 'seconds' by the major manufacturers. These are often good sticks, which don't quite make the highest criteria. Also check out British-made sticks by Shaw and other companies, which are sometimes unbranded. 4. Are you heavy handed? If you break a lot of sticks try a heavier model or a type with a thicker neck and shoulder. You might want to alter the angle of your crash cymbals as well so they don't continually cut into your sticks. Designations like 2B are not standardised. Manufacturers use the same designations but make different lengths, shapes and weights. Even worse, you will sometimes find the same size stick by different manufacturers bearing different designations, like 6A and 7A. 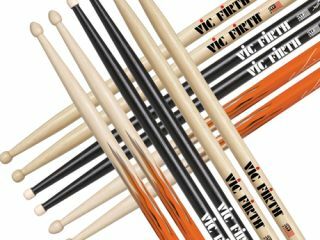 Synthetic sticks generally last three to eight times longer than wood. But they're usually three times as expensive. To combat sweaty hands you could try antiperspirant lotion, wrapping your sticks with stick wrap or buying special light, thin gloves. Some drummers sand their sticks in the grip area for greater friction. Or look our for sticks which have no shiny lacquer. For the best monthly drumming tips, video lessons and reviews, check out Rhythm Magazine.